It's a pretty safe bet that if you asked most Australians, or indeed anyone, whereabouts in the world was the Sea of Cortes, you'd get more blank looks than correct answers. 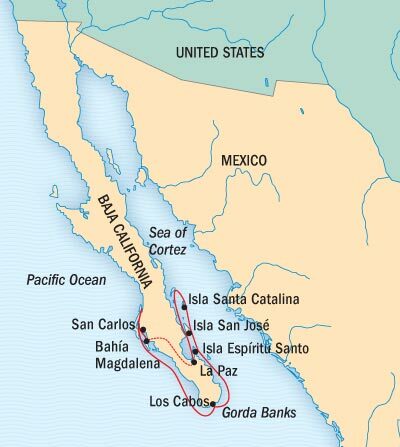 Also known as the Gulf of California, it is bordered to the west by the peninsula that is the Mexican state of Baja California and to the east, the mainland states of Sonora and Sinaloa. With a coastline of approximately 4,000 km, it encloses 160,000 sq km of gorgeous ocean. Conventional, big ship cruise lines like Royal Caribbean head south from the US to the very tip of the peninsula and the flourishing resort city of Cabo San Lucas, but a few smaller expedition cruise lines like Lindblad Expeditions-National Geographic turn the corner and head north into the Gulf proper. Since 2005, the coastal region and the 244 islands and islets have been inscribed by UNESCO on their World Heritage list. They're not kidding. The Gulf of California is teeming with marine life or all kinds. It seems every day we are seeing whales, dolphins, porpoises, seals, sea lions and seabirds of numerous species. Had I been here a few weeks earlier, I might have seen the majestic California gray or Humpback whales before they left for northern waters. But others like the mighty sperm and fin whales have resident populations that just hang here year round feeding on the abundance of food delivered by the favourable currents and submarine terrain working in happy unison. I'm told it was a young Sven Lindblad who came down here in the late '70s and immediately recognised the value of the region and its suitability for expedition style travel which his family were already famous for. Now, more than 30 years on, Lindblad Expeditions-National Geographic set the benchmark for small ship exploration here with the twin, 62-guest vessels, Sea Bird and Sea Lion. Guests are immersed in a daily ritual of wildlife spotting, Zodiac cruising, shore excursions, snorkelling, kayaking and, in between times, shipboard lectures and enrichment. It's a non-stop naturalist's cavalcade often compared to the Galápagos. The season runs from December to April annually, but guests need to be mindful of the migrating species like Blue, Humpback and Gray whales if this is what they hope to see. The Grays, for example, are all but gone by mid-April and on their way north to places like Puget Sound in Canada.